The workflow consists of firstly identifying spot (which can be also gravity center of cells identified by another method), and then secondly compute trajectories by linking these spots by global optimisation with a cost function. This method is part of the methods evaluated in Chanouard et al (2014) as "method 9" and is described in detail in its supplementary PDF (page 65). A pdf file with instructions and output description is also available in the zip . MTrackJ : Used for visualization of tracks. Preinstalled in Fiji. Imagescience.jar: This library is used by MTrackJ. Use update site to install this plugin. can be used in batch, some analysis results provided. 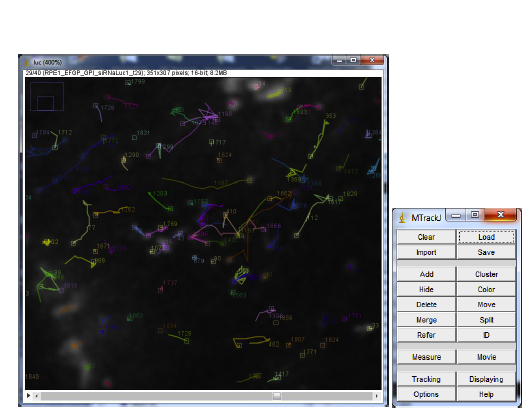 The tracking part is not dependent of ImageJ. the optimization algorithm used is a simulated annealing, so results can be slightly different between two runs.